Single Pin Slider Sight with Accu-Clicks:Pick it. Click it. Stick it! The AccuTouch Series of sights hits the single pin slider market with a Bang, combining the hottest technology with the hottest features archers demand! Patent pending Accu-Clicks make this state-of-the-art Single Pin slider sight function like a multi-pin sight. Set each Accu-Click at a specific distance (i.e. 20yards, 30 yards, ect) so that the slider will stop where you want it. Simply â€œpickâ€ your distance, â€œclickâ€ it into place, and â€œstickâ€ your target! A 45 degree rear-facing sight scale allows easy recognition of where the sight pointer is set, which is teamed with Accu-Clicks that allow the archer to easily set their sight from an armâ€™s length away! The AccuTouch sight brings new technology to the sight market on a whole with a patent pending, adjustable Red Elevation Tension Lever. 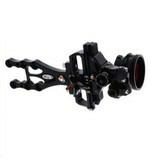 This tension lever provides the archer with their own personal choice of how easily the sight slides along the elevation bar. The AccuTouch Sights feature ALL axis leveling capabilities from the first axis adjustment where NO shims are needed to the ever popular, separate 2nd and 3rd axis leveling on the head of the scope attachment! Another feature of the AccuTouch is the Windage Lock Button that, when engaged, does not allow the micro-adjustable windage knob to turn. Simply disengage the Windage Lock to make a windage adjustment. The AccuTouch also features a superior Windage Dovetail Guide System that provides Zero backlash. These features are demanded when in the heat of the moment, and when seconds could cost you that big game animal of a lifetime! 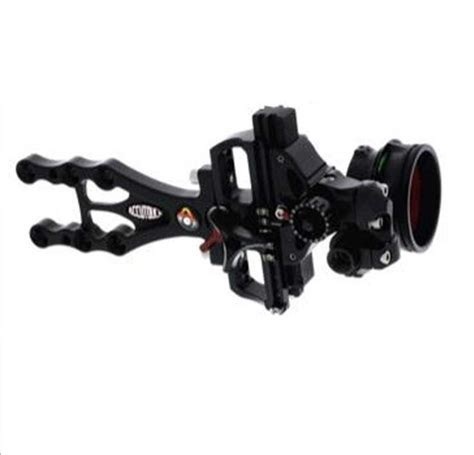 The AccuTouch is available with a MathewsÂ® Harmonic Damper direct mount version as well as a Non-Damper direct mount version which are paired with the X-41 Scope, measuring 1 Â¾â€ diameter for a wide field of view. The AccuTouch Pro is a dovetail version featuring a 6â€ Carbon bar, designed with the most Advanced Composite Carbon Technology. The AccuTouch Carbon Pro bar features a higher weight to strength ratio as compared to similar aluminum models. Arguably, one of the greatest features of the AccuTouch Carbon Pro is its high resistance to wind due to creative machining of intricate cutouts and chamfers. The AccuTouch Carbon Pro can be paired with the X-31 Scope that measures 1 3/8â€ diameter or the X-41 Scope of 1-3/4â€ diameter. All versions of the AccuTouch sold with the X-31 or X-41 scope can be selected with either 0.019 or 0.010 green fiber optic ring pins. The AccuTouch is also sold without a scope configuration, making it versatile for those that want to incorporate their own choice of scopes and pins by connection through the non-threaded or threaded scope barrel currently used on our target sight models. The Real #1! The AccuTouch Slider Sight-Leading Technology, Proven Results!